Our recent game in Montreal really taught me that scenario design is a lot more complicated then just throwing two balanced forces together. 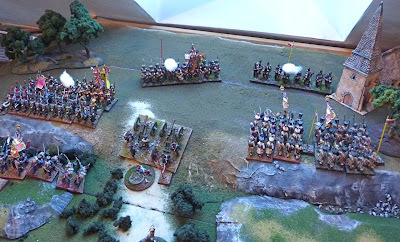 I had looked quite forward to the game, we were going to use a set of rules that I like but had not used in awhile, and I really enjoy recreating historical battles. It ended up being a bit of a debacle, mostly because I really failed to consider the complex nature of the terrain in the scenario in respect to the ruleset. 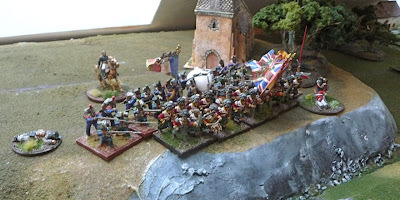 Essentially we had a superior force of French climbing a heavily wooded hill in an attempt to displace a smaller force of well entrenched Anglo-Portuguese. It should have been good scenario, but the French just walked over the Allies, really because there was no way to stop them. I really like the Field of Battle ruleset from Piquet, they have a simple combat mechanism, with a card driven activation. It is a easy ruleset to learn. What I had failed to realize was that no rule set can really fit all scenarios and that the utilization of scenario specific rules is absolutely necessary. 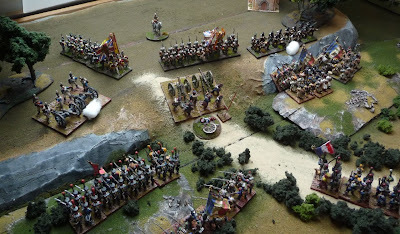 So I sought help from the Piquet Forum, this is one of the biggest Napoleonic forums on Yahoo groups, and you usually can get answers to any question within 1-2 hours. 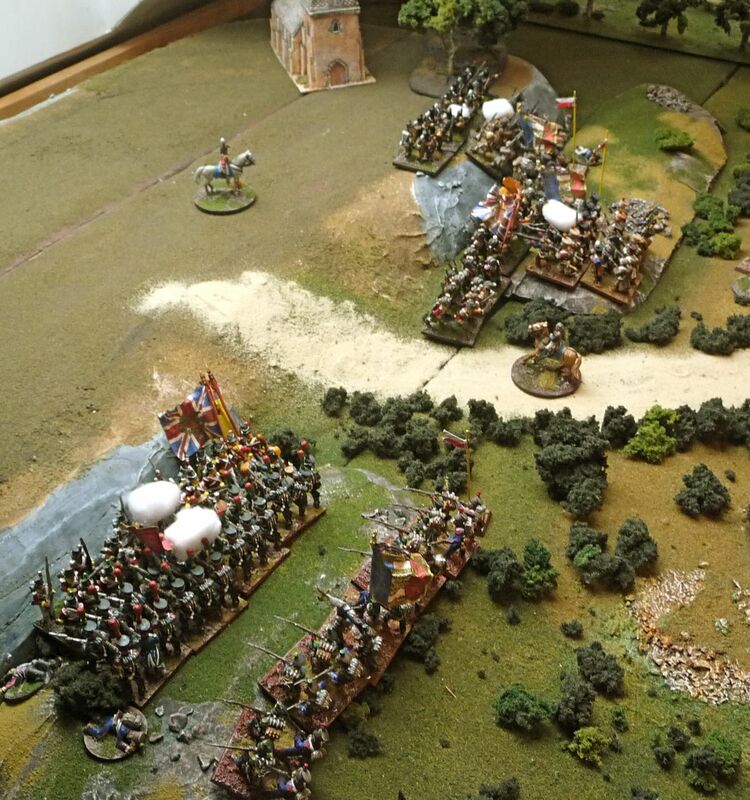 So for help I went there, almost immediately Brent Oman (writer of the ruleset) provided some rules clarifications and Peter Anderson (the guru of all things FoB) provided some excellent advice on rules modification in respect to the terrain. Many others pitched in with excellent advice. 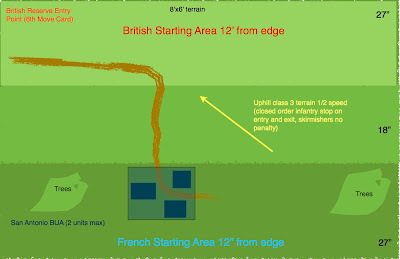 British Artillery fixed and French only being able to unlimber in Class I terrain, ie. on the ridge or on the trail traversing the hill. No distance penalty for firing in Class III terrain, but a DOWN1 modifier for firing from within to without and visa versa for all units except skirmishers. Original dispositions with the 5 French Infantry units in the foreground with one unit of limbered artillery. They are starting at the base of the hill about to enter the class III terrain. The Anglo-Portuguese are in the background. 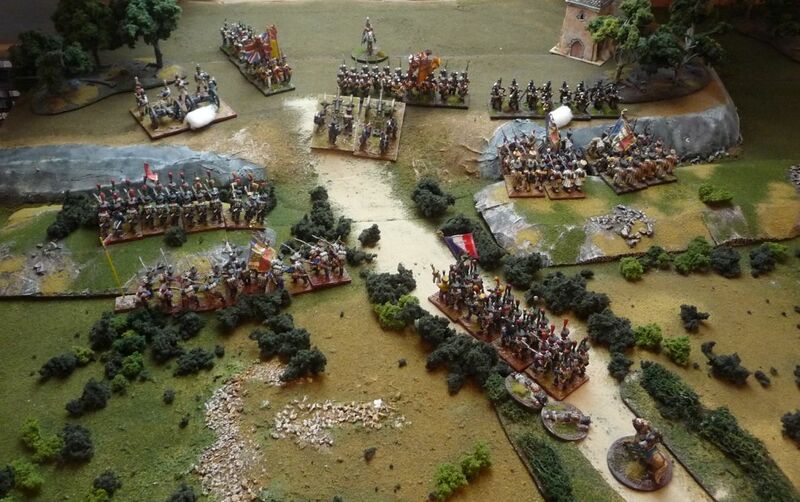 The rapid advance of the French, some up the trail and some through rough terrain. Their artillery are able to advance rapidly and unlimber, but the 92nd has been able to melee...not good. 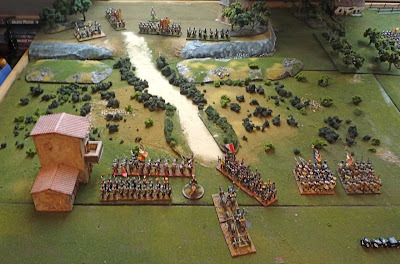 As you can see the British have been raining fire down on the French and the French have repeatedly gone out of command while traversing the rough ground. The French artillery are silenced and pretty well done. 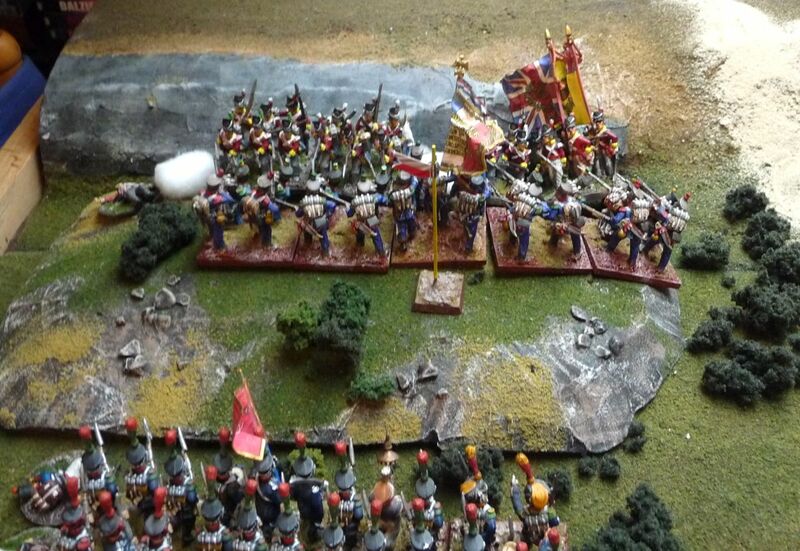 The French attack columns falling out of command (the little flag) as they attempt to ascend the ridge. On the British right, the 2/13e légere have also gained the ridge and destroyed the British artillery, the Connaught Rangers form into line. Are they going to repeat history. 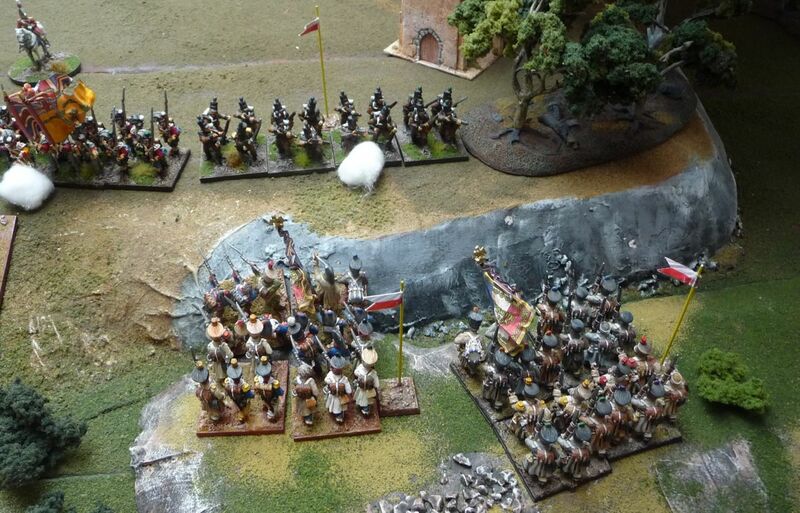 So far it looks like tough going for the British! 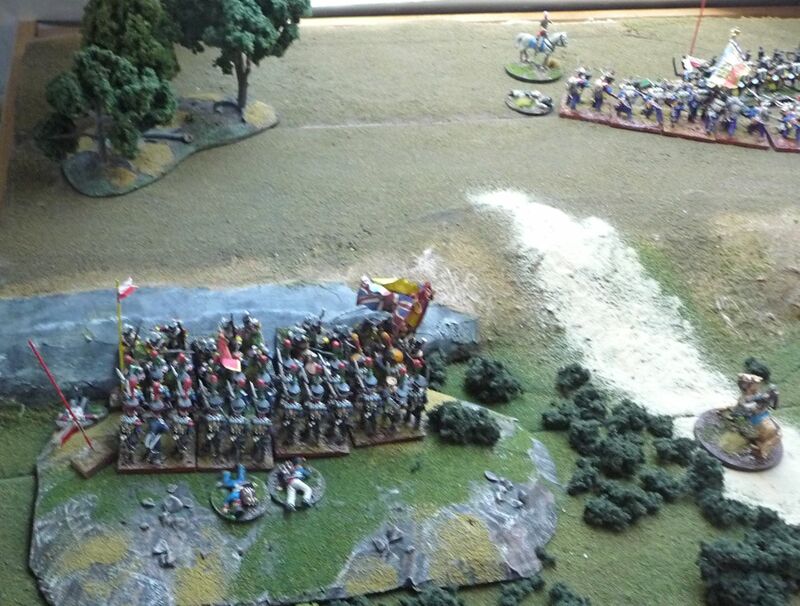 The 88th fire as the 2/13e légere advance to melee they take casualties, but are able to engage. 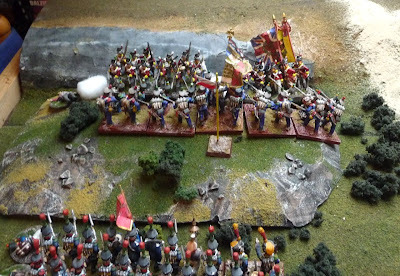 A second French battalion on the British left as surmounted the ridge. Is it going to be a repeat of Carnage in Montreal. 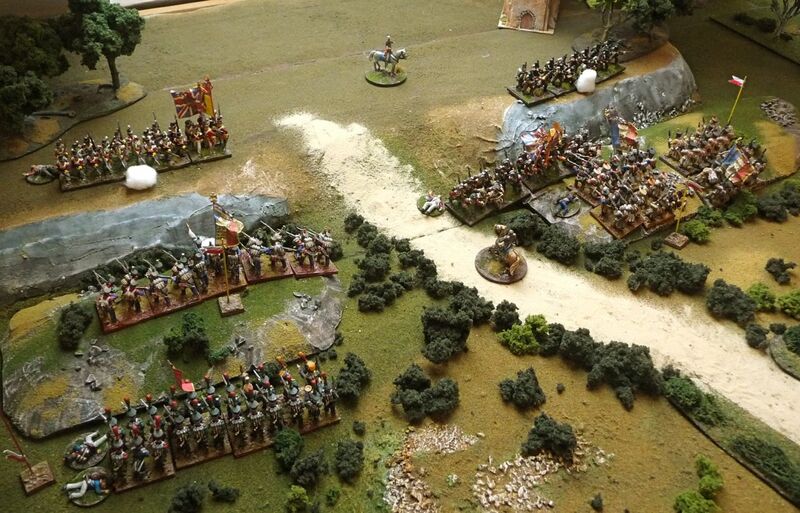 End of Turn 1. Well the battle turns abruptly! The 2/13e lose their melee and are thrown back. 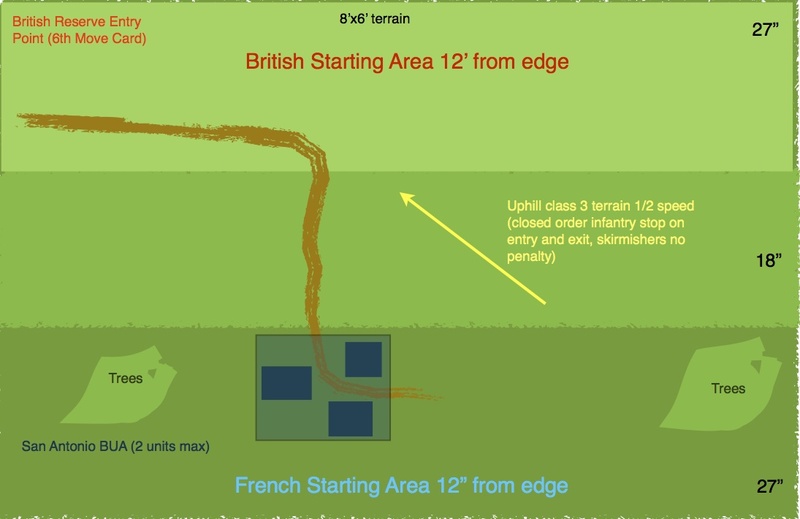 The British draw multiple fire cards and are able to force the two French ligne back down the ridge by steady and sustained fire. What did Sharpe say? Something about the ability to stand and fire 3 rounds per minute. Looks like he was right. Both the caçadores and the 92nd regain their moxy and advance with the Scots actually charging down the hill to engage the French. Looks like we are having a real back and forth. The 1e légere are thrown back. The 92nd throw back the French ligne. Heudelet is able to rally his troops though and despite considerable losses the French ligne reform and advance relentlessly back up the hill. Mackinnon se fait entendre pour dire que ces français sont fous! 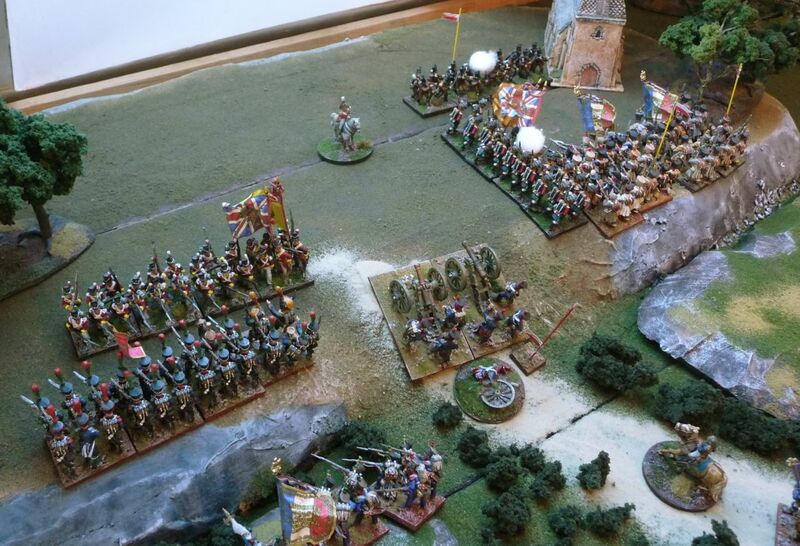 The Irish are thrown back up the hill, but the Scots are able to rout the 2e ligne. The 1e ligne again however regain the ridge with only the Portuguese skirmishers to confront them. Turn 2 ends abruptly on a tie for Initiative. 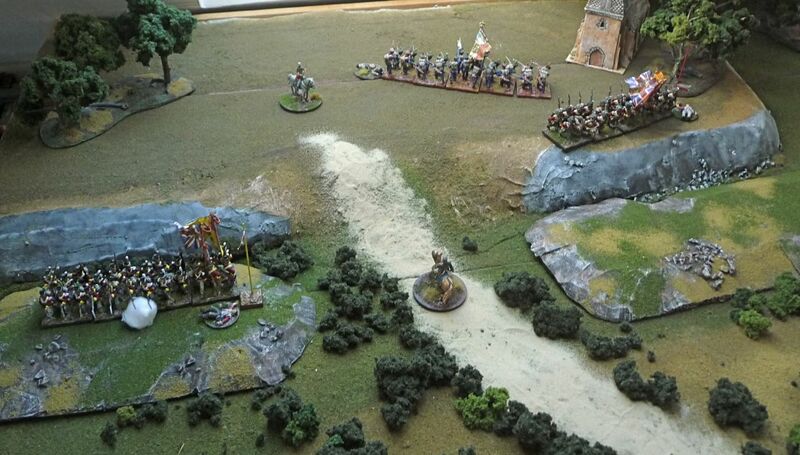 The crazed Irish again attack down the hill, the 2/13e have taken many casualties. But what is happening off to the right it looks like the 1e légere have been able to rapidly advance to the engage the caçadores in melee. The French destroy the caçadores and they are behind the 92nd who have been able to rout the ligne. Unfortunately for the British the French still have the initiative. 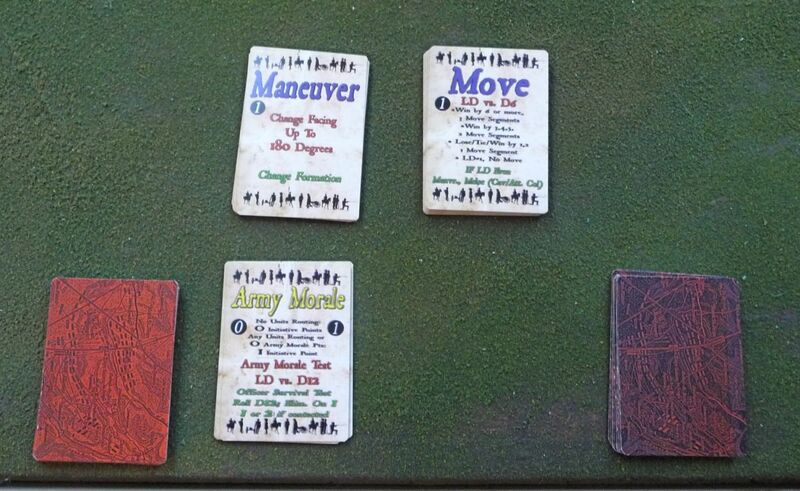 I suspect if a move card is drawn and they throw even the Scots are going to take it up the arse! 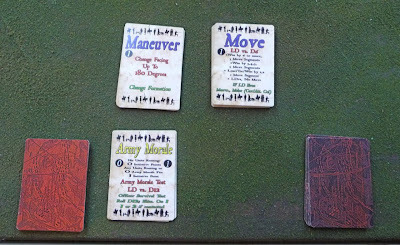 ............an Army Morale card, they fail and the game is finished with a French Victory. Well I really found this a fun game, and what I was hopeing for from the game in Montreal. Planning...it is all in the planning. Lets hope I can get the guys to play FoB again. But for our next game in 2 weeks, I really do not have to worry as we have a very knowledgable Games Master coming all the way from the Regina to Montreal to host a game for us. Glad the second time worked more like you had hoped for! 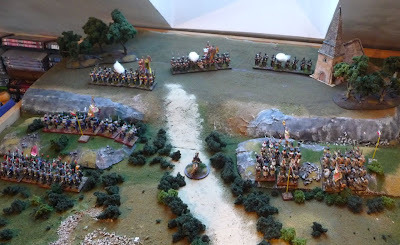 I've said it before, but I think Scenario design is perhaps the most difficult aspect of our hobby. Adapting Historical battles (and having them be a good *game* as well) is even harder. All rules sets have their nuances, and that must be taken into account as well. I've run some scenarios that went off perfectly, and others where I was very glad the players were so tolerant of the obvious flaws! "Guru of all things F.o.B." - LOL! It was great to follow the game via the photos. The ability to stop and take photographs whenever is one of the benefits of a solo game I guess.